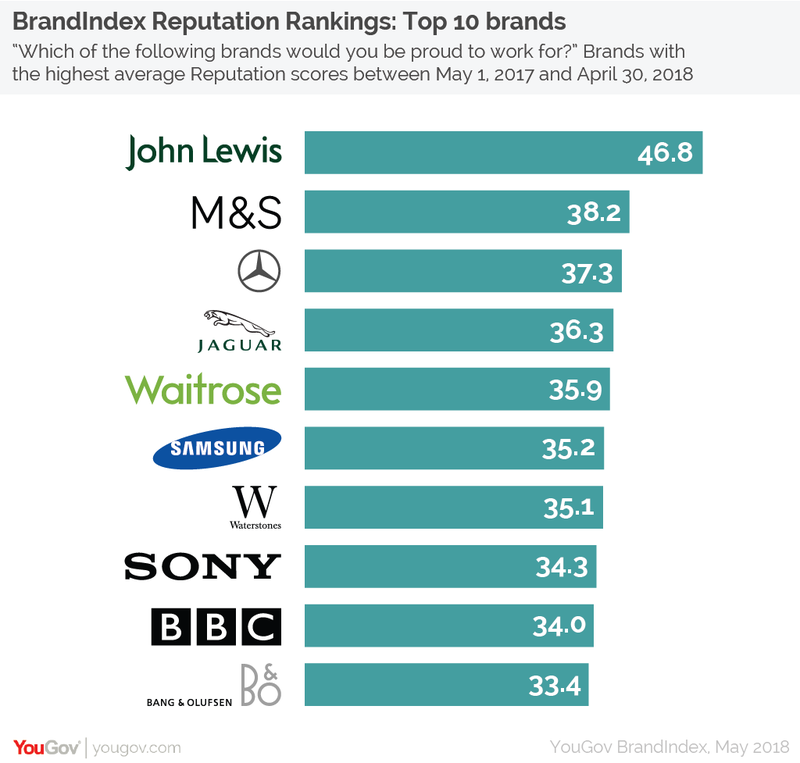 May 22, 2018, 8:31 a.m.
John Lewis is the brand that Britons would be proudest to work for according to new analysis from YouGov BrandIndex. The high-street giant tops the Employer Brand Reputation rankings with a score of 46.8, ahead of another traditional favourite, Marks and Spencer (38.2), and German car manufacturer Mercedes-Benz in third (37.3). Another automotive brand, Jaguar, is in fourth (36.3), while supermarket Waitrose completes the top five (35.9). 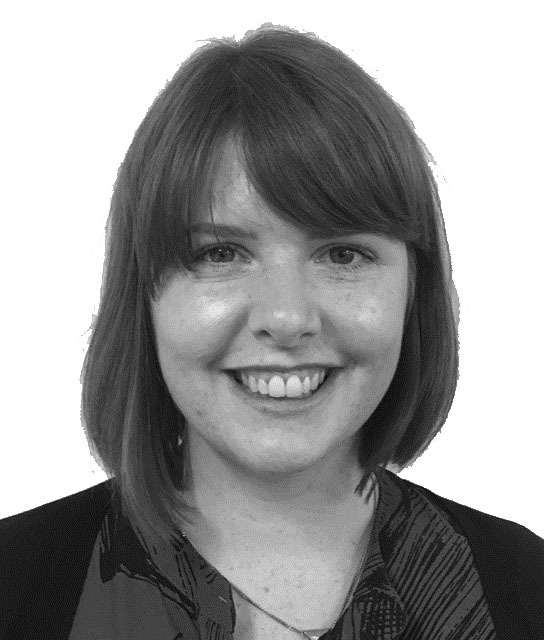 Every day, YouGov asks the public whether they would be proud or embarrassed to say that they work at a company, and this then forms a brand’s ‘Employer Brand Reputation’ score. Elsewhere in the top ten, tech brand Samsung is in sixth (35.2), closely followed by bookseller Waterstones (35.1), and Sony (34.3). BBC.co.uk (34.0) and Danish consumer electronics brand Bang & Olufsen (33.4) round off the top ten. Notably, there was variance across different age groups. Netflix is the company those aged 18-34 would be most proud to work for, ahead of John Lewis and Google. Spotify is also in the top five among this group. John Lewis was top choice for those aged 35+. For years John Lewis has been known for treating its staff well and, despite cuts to its much heralded bonus scheme, it’s still the employer people would be proudest to work for. Higher-end employers dominate the list, suggesting that – even in a time where value stores are edging in – consumers still favour older, ‘legacy’ brands with a reputation for quality. When it comes to younger people, a much younger brand – Netflix – is the preferred employer. This is understandable given its popularity among this group and because is seen as being a company that encourages creativity and artistic freedom, both of which would make it an attractive place to work. YouGov has also published its top ten improvers for this metric. 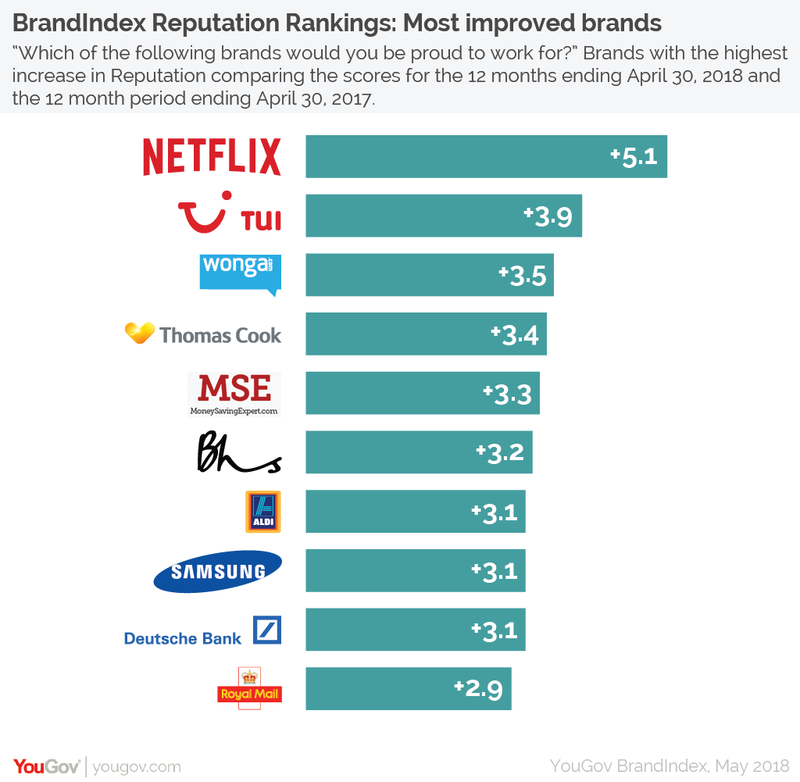 Netflix is also the most improved brand in terms of Employer Brand Reputation score, with its score increasing by +5.1 points over the past year. It edges out travel operator TUI (+3.9) while Wonga is third most improved (+3.4). Thomas Cook (+3.4) and MoneySavingExpert.com (+3.5) make up the rest of the top five improvers.